I suppose I should start this post by admitting up-front that I did some serious scanning (as opposed to in-depth reading) of The Decline and Fall of the British Aristocracy, by David Cannadine. I was expecting social history, with a lot of quotations about the sad lack of polo matches and elaborate picnics and the horrors of death taxes. What I got was a lot of charts (a lot of charts), long lists of names, and something that resembled a PhD thesis much more than a social history. That's not to say this book isn't full of interesting facts. It is. But it's also full of a lot of other things that I didn't find interesting. The subject matter is pretty well summed up in the title of the book - Cannadine writes about how the British upper-class fell from the very heights of its power to becoming pretty much like everyone else. I've had this book on my shelf for a long time; those of you who have read this blog for a while know that I am obsessed with British history. The impetus to read it, though, came after reading Sarah Waters' The Little Stranger, which revolves around the decline of a family and the grand country estate in which they live. I wanted to understand more of the context around the situation. 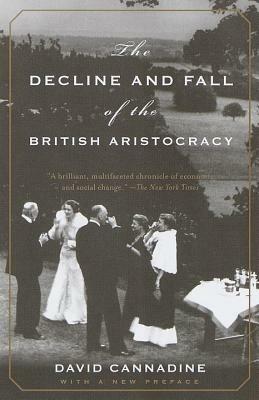 In reading this book, I certainly understood the drivers behind the decline of the aristocracy (the "grandees," as Cannadine calls them, though I didn't realize that term was defined as narrowly as he uses it). There was the loss of power in the House of Lords, increased taxes, loss of rental income, the proliferation of new titles, World War I, etc. But I didn't get the social information that I was craving. How did the grand old families feel about all the new earls walking around the country? I got a few hints, but no real insights. How did they feel to have to sell off their family homes and land? I don't know. How did everyone else in the country feel - did they quickly take advantage of the more egalitarian system or were they mistrustful? I don't know. And that's what I wanted from this book, more of the personal experiences. I wonder, if I were British, whether this book would have had more of an impact on me. But even if I had been born in Britain, I'd still have been from an immigrant family, and I think this book probably means more to those people with deeply-entrenched roots in the country - at least over the past 300 years - to know how drastically things have changed. It is hard for me to justify a world in which people were born into wealth and privilege and security, and everyone else had to scrape by on the crumbs. But at the same time, I do wish we had some of that back - working in such a capitalist world now, it's easy to forget how decisions you make trickle down to effect other people. At least in the past, theoretically, the aristocracy was expected to provide for the people under their care. And they provided for artists and poets and architects, too. I wish we had more of that appreciation for the arts today. But none of that wistfulness or bittersweet feeling came through in this book, which disappointed me. A lot of information presented, but nothing to bring it to life. Sorry this book was disappointing overall! I'm reading a book that I'm having just the same reaction to--Called To Serve, which is a history of nuns in the US. I could have said your exact comments--I'm learning things, yeah, but there are huge long lists of names and dates and who went where and served when, and precious little about the human story, the individuals and how they felt about things. I'm actually probably going to stop reading it, just because it's so dry (and repetitive, but I think that's because the founding of one convent is very like another, when taken without the human story). I'm looking for a book too that will address the questions that you ask, it seems like this might be a little too dry for my tastes. You comment on wishing to have some of the old is interesting because I have felt that same pull while watching Downton Abbey. Yes, you want the change, but I could appreciate the concern for the land and the people. Things are so much more impersonal and sink or swim. But all things considered, it's progress. Sounds like the book missed the mark but there were still some interesting bits. I would have expected much more insight with a book focused on social history as well. Sorry to tell you this but when historians talk about "social history," they mean books full of charts and names that read like a dissertation with lots of data from sources like the census and legal records. Don't expect them to be about what you might think of as "social life." You's just be disappointed. I love when a fictional read inspires me to get the facts. Unfortunately, I am rarely as engaged by the non-fiction as I was by the other story. It seems like it is somewhat difficult to write history and non-fiction that is informative without being dry. >>>a lot of quotations about the sad lack of polo matches and elaborate picnics and the horrors of death taxes. I laughed out loud at this. That's exactly what I would have expected too.